If there is anything in the world that every human being craves for it is success. People want to succeed in everything they do, and it is the hope of success, that makes people progress in life. Desire to succeed is what drives people to work hard and smart and it is success that makes one person above the other. But it is not enough to have dreams, you should learn and accumulate all the knowledge that will help you to make progress towards success and start acting on it. 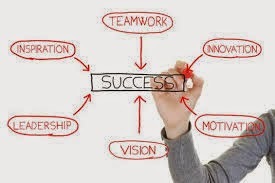 Let us look at the factors that contribute towards success. 1. Plan your day: Planning is very important if you want to achieve success, make a list of your activities, prioritize and then see how much time are you able to spend towards achieving your goal, this will help you to make progress towards achieving success. 2. Start Acting on Action Plan: It is not enough if you put in writing all your goals. You need to keep working on them even a bit a day, only then you will be able to reach your goal. 3. Have Big Goals: It is thinking big that differentiates the successful people from the others. Successful people aim big and never hesitate to have big goals, their thinking is big their goals are big and their action part is also big. So don’t ever hesitate to think high and big. 4. Expect Difficulties: The road to success is not an easy path, expect difficulties and hurdles prepare yourself physically and mentally and maintain balance and then it would be easy for you to overcome problems and to reach your goal. 5. Lead a Balanced Life: Balance is the essence of life, balance in thought and balance in action. So, always try to strike balance eat balanced and healthy food, exercise, read good literature that motivates you and encourages you. Maintain a balance in physical and mental activity. Following these lessons and implementing them will help you to achieve success in your desired field.